Searching through apps in the App Store on your iPhone can be a rabbit hole -- you search for a term and then scroll endlessly through the results to find just the right app that you need. When you want to return to the beginning of your search results, most people just scroll backwards, tediously swiping multiple times to return where they started. There is an easier way to hop back to the beginning of your search with just one tap. When you have scrolled through a few dozen apps in the search results, you can just tap on the search icon in the bottom bar and jump back to the beginning of your search list. If you have gone a step further by looking at individual apps and browsed through their related apps list, the same search icon tap will bring you back to the original app that you were viewing. In the example shown above, you can view GameChanger in the search results, tap on it to view its details and its related apps, and then tap on the related app iScore to view its details. To get back to GameChanger in the search results, you can tap the 'Search" icon at the bottom to jump all the way back in one step. 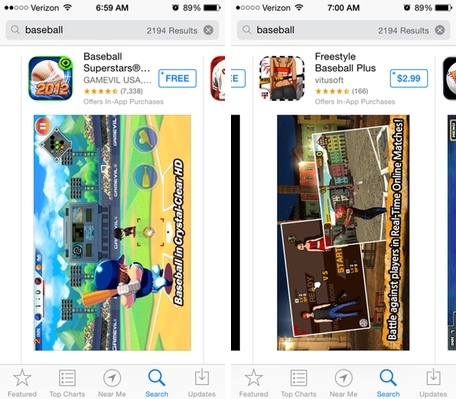 Tap the search icon again, and you will return to the beginning of the search results. 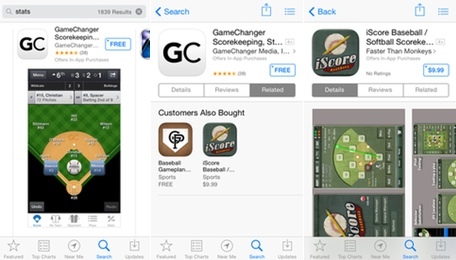 iPhone 101: Improve the App Store search experience with this tiny trick originally appeared on Breaking Apple News, Tips and Reviews from The Unofficial Apple Weblog on Tue, 15 Apr 2014 11:00:00 EST. Please see our terms for use of feeds.